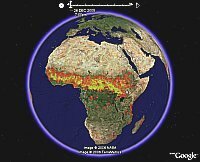 Last January, Valery Hronusov (who has created many very interesting applications with Google Earth) published a collection of data from NASA's MODIS environmental satellites Terra and Aqua which highlight global fires. See details from my earlier post. Now Valery has taken the same data source, updated it to current data from NASA, and time stamped each photo which is then overlayed on the Earth. Now, using the new time feature in Google Earth 4, you can see a time animation of the fires of the Earth. Download the network link and turn on "Wildfire" in the "Temporary Places" folder. I would recommend using the "small 600x300" folder (unless you are confident you have lots of computer memory). Then start by turning on say "2006". You will see the earth with red and yellow areas indicating strength of fires capture at a specific 10-day period. You will also see the time gadget at the top of the screen (if you are using GE 4 version 4.0.2091+). Then click on the right triangular "play" button on the right of the time gadget to watch an animation of fire over the course of a year (the first time through it has to load the images). Spin the Earth while the animation is looping to see all sides of the data. It's very interesting to see how many fires are going on all over the world - year after year. And this time animation is really fun to watch. Great work Valery, as usual! See other things Valery has developed which are documented in GEB. Guys from MODIS Rapid Response System center add to 10 days dataset also one 365 days :) 01/01/05 - 12/31/05 (2005001-2005365)I do not know before about. Interest fact. With GE we can fast detect and search this problem. Now i simple remove link to http://rapidfire.sci.gsfc.nasa.gov/firemaps/?2005001-2005365 and no problems. All other dataset is good.